In an unexpectedly downbeat jobs report, employers added only 38,000 jobs last month, the worst month for job gains since employment started recovering in 2010. Downward revisions trimmed the employment gains for the prior two months by 59,000, and the labor force participation rate fell again in May, as it had in April. That drove the unemployment rate down to a recovery low of 4.7 percent, but for the wrong reason: not because of people getting jobs but because of people leaving the job market. Given the volatility in these monthly reports, I have been appropriately cautious in suggesting that the US job engine has truly downshifted. However, a look at JB’s monthly smoother now at least tentatively supports that conclusion. 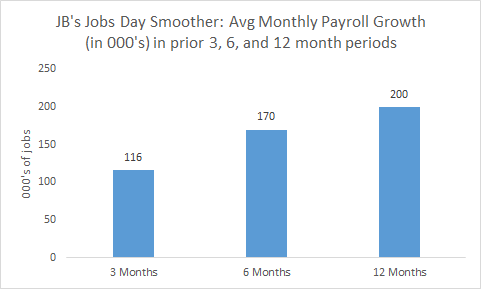 Going from 12, to 6, to 3 month averages of monthly job gains shows a steady deceleration from 200,000 to 116,000. This new, slower trend could, of course, reverse if growth picks up and part of May’s very low topline number is due to the strike at Verizon, a one-off event which, according to the Bureau, reduced the payroll count by about 35,000. But even adding those information workers back into May’s tally, the three-month bar in the smoother would rise to 127,000, still well below the 200,000 trend over the last 12 months. The negative report surely puts the nail in the coffin of a Fed rate hike at their meeting later this month. Prior to the report, the futures market probability of a June hike was about 20 percent. After the release, it quickly fell to 4 percent. Weak job creation is weighing on the labor force participation rate, which is down 0.4 tenths of a percent over the last two months. At 62.6 percent, the LFPR is back to where it was last December. While retiring baby-boomers have been correctly cited as a structural—vs. cyclical—factor lowering participation, the recent decline has also occurred among “prime-age” workers, those 25-54. In other words, what we’re seeing here is more than a benign, demographic trend; it’s a trend that is also a function of weak labor demand failing to pull people into to the job market. Most goods-producing industries shed jobs in May, including durable manufacturing, down 18,000. Over the past 12 months, this important manufacturing sub-sector has shed 80,000 jobs, a sharp reversal from the addition of 120,000 jobs in the prior 12 months. The stronger dollar, which makes our exports less price-competitive, is a major factor in this unfortunate turnaround. Another sign of weak labor demand was the increase in involuntary part-timers – i.e., those who would prefer full-time jobs – by 470,000. Again, the monthly series is noisy, so we should discount the large jump, but the underemployment rate, which includes these workers, remains stuck at 9.7 percent, at least a point above where it would be in a full-employment job market. There were some bright spots in the report. Job creation in health care continues to churn along, with employment up 46,000 last month and about 490,000 over the past year. As we’ve shown, this favorable trend coincided with the advent of health care reform’s premium subsidies and Medicaid expansion; it’s unlikely that’s a coincidence. The unemployment rate for workers with at least some college attainment held at lower than average rates of about 4 percent for those with some college and 2.4 percent for those with college degrees, and their LFPRs did not fall in May. Finally, wage growth rose a mild 0.2 percent over the month, but is up 2.5 percent over the past year. That’s an acceleration over the 2 percent growth rate that prevailed last year at around this time. The lower trend in job creation that appears to have taken hold could, as noted, reverse. Real GDP growth in the first quarter of the year was less than 1 percent, and current forecasts for the second quarter are tracking well above that. Then there’s the strike, and weather issues could also be adding noise to the data. But it would be a mistake to write off these dour numbers. Moreover, while the Fed can certainly do no harm by holding rates steady, that’s not the same as helping. Fiscal policy is looking more and more like an essential, missing ingredient in labor demand, and with borrowing costs still as low as they are, a smart move by policy makers would be to quickly start up an infrastructure program, perhaps in the critically important areas of water safety or our long-ignored public school facilities. Clearly, in the midst of both political dysfunction and a contentious election, this would be a heavy political lift. But it’s still the right thing to do. Share the post "May’s seriously downbeat jobs report puts kibosh on Fed rate hike; underscores need for deep infrastructure dive"
9 comments in reply to "May’s seriously downbeat jobs report puts kibosh on Fed rate hike; underscores need for deep infrastructure dive"
“Fiscal policy is looking more and more like an essential, missing ingredient in labor demand,” wow, and how. The lack of appropriate fiscal action on the part of congress for 7 years has been a staggering blow to our returning to an economy that is functioning at full capacity. And with interest rates so low, NOW is the time we can afford it. One other thought.. I find the recent reports that the recovery is much more a local phenomenon confined to large population centers quite interesting. As I drive to work through Greenville, SC, it’s fun to keep a count of the large cranes rising into the sky on new building projects in the city. Granted, it’s not a scientific measure; but even our medium sized population center is fairly bustling with activity compared with the rural county where I start each day’s commute. Sorry Jared, that was a upbeat report bothered by the Verizon strike. I am not just talking about the 35-36 thousand lost, but the multiplier the bls uses which means 35-36 turn into 150,000. Part time hiring surged, forecasting a big surge in the establishment survey in future months. You don’t just drop to 4.7% by people ‘dropping out of the labor force’, it was the surge in part time hiring. Even the U-6 was unchanged. Also the link below mentions the source of part time hiring surge may have been Verizon. The strike effected seasonal adjustments, which have been overhauled to stop the weak first, strong 2nd, weak 3rd, strong 4th quarterly bias. This kind of downturn in job growth looks suspect. Aprils number may be even worse than Mays. May was a softer month, but not that soft. Clear overkill. No way do the Republicans give Obama any fiscal stimulus now in the middle of what as you say is a contentious election. When was the last time the GOP Congress did the right thing because it’s the right thing? The Fed could do more as well, it could cut rates. It probably won’t want to do this as it would feel silly lowering them again so soon after raising them. But like you said, it’s the right thing to do. But the Fed worries more about its own embarrassment than doing the right thing too. I really don’t buy this post-facto rationalization “While retiring baby-boomers have been correctly cited as a structural—vs. cyclical—factor lowering participation.” Jared, you are not the only person that says it, but when everybody says it, it’s probably wrong. The people retiring early are those who earn low wages and will get minimum Social Security benefits and no pension. In other words, they are the people least able to afford retirement. These are often older guys who can’t lift 30 pounds anymore and can’t compete for less strenuous work in a slack labor market. They may count as statistically out of the labor force, but they are unemployed. Offer them something that they could do for $12/hour that would not kill their backs and they would work again. ISM Non Manufacturing fell to 52.9. The lowest since 2010, yes ? The jobs numbers are much worse when you consider the employment situation in terms of skills match. More to say on this in a minute. While this obvious skills mismatch problem is readily apparent to anyone who looks into the matter, the New York Times decided to run a story that not only buries this story, but also provides very misleading data while belittling the general public’s common sense. Yes figures don’t lie, except when they are manipulated to purport to show something that doesn’t truly exist. So yeah, by time you’re 34 after graduating college probably a decade earlier, you’ve averaged only 2.5% unemployment. But when you just graduated, your cohort is about 6.8% (class of 2015 see link). Yes it’s worse for the just graduated high school graduate, but just citing the 2.5% figure is deceptive. Plus you’ve left out the “don’t need a degree for the job anyway” for half of that just graduated college group. This also explains why high school grad unemployment is so high, too many of their jobs are taken by college graduates. While there certainly is a segment of the labor pool that by virtue of not graduating high school are missing important job skills or did but still fall short of employer expectations, the bigger story and predominant state of affairs is that of a vastly over educated workforce. A progressive societal goal of allowing everyone to attend college to create an enlightened citizenship doesn’t negate or conflict with this realization. Two thirds of all jobs require a high school diploma or less according to the BLS. The obvious policy implication is to stop claiming there’s a high skills job shortage that needs to be filled by temporary workers. Any questions? 7.2% not 6.8%, is the unemployment rate for all new college graduates (college graduates, as in 22, 23 and 24 years old), I inadvertently used the separate figure for women. For just men, it would be 7.8%.